Karl Klug might be the toughest Titan. He might not be the toughest 29-year-old man with the last name of Klug living in Nashville. If Karl’s identical twin, Kevin, was going to engage his brother in a scrap or wrestling match, he’d have to build into a rage first. Kevin always gave up at least 10 pounds to Karl, and at one point in their lives it was about 60. Karl agrees with that outlook – “You kind of have to flip a switch to play in this league,” he said – and that’s no surprise considering these are twins who talk about four times a day and are said in the family to have their own language. “Grind” is an English-language word they both use a lot. In the past few months, Kevin has seen his young business, Klug Fitness, grow quickly. He’ll bring a full-size van with a gym in it to you. 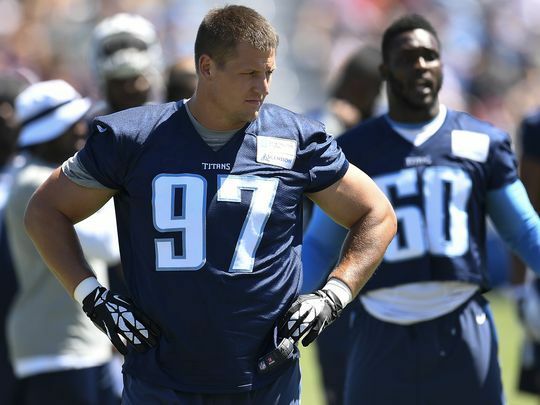 Also in the past few months, Karl has obliterated the expectations of doctors and put himself in position to help the Titans defensive line in the Sept. 10 opener against Oakland. The original timeline, after Karl tore his left Achilles tendon in a Dec. 19 win at Kansas City, had him in street clothes and weeks away from returning at the start of the 2017 season. But the 6-foot-3, 278-pound defensive lineman was out there running at the start of his seventh training camp, a full two months earlier than that was supposed to happen. So add it to the legend of the man who gets an appreciative “Kluuuuuuug” from fans when he makes a play. And understand that his return to the field this season is more than a nice story. It’s crucial for a defensive line and a team that draw from his relentlessness. Coach Mike Mularkey said Karl was an “animal” during his offseason rehabilitation, which included the use of painful blood-flow restriction therapy to stimulate the muscles around the tendon. He was a top candidate for toughest guy in a locker room full of tough guys before this injury, but now it’s almost silly to consider anyone else. He’s certainly the only guy in the room who still uses a flip phone. Karl and his wife, Stacy, have three children ages 4 and younger, and when he reunites with them for a few minutes after a training camp practice, he’s a happy-go-lucky father. His on-field alter ego has far exceeded expectations to provide for them. Even with Karl rehabbing an injury that can permanently hinder an athlete’s mobility, the Titans signed him to a two-year, $5 million deal in the offseason. 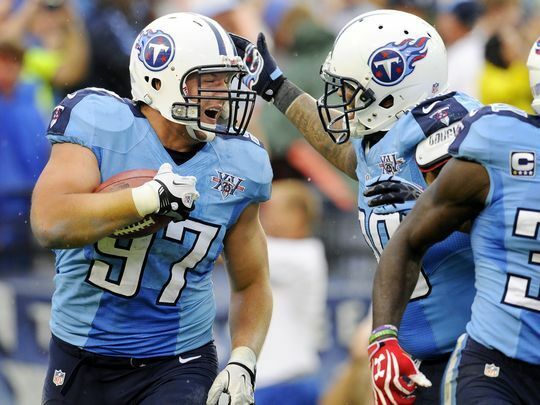 Before the injury cost him the final two games of the 2016 season, Karl had seen action in 94 straight games, starting with his rookie season of 2011 after the Titans took him in the fifth round out of Iowa. He has played through nagging injuries, as he did at Iowa – a herniated disc and torn ligaments in a big toe, to name two that actually got reported. Quiet tolerance is a family tradition. When the twins were in middle school in their hometown of Caledonia, Minn., Kevin suffered from a condition that caused him to throw up after meals and choke on his own saliva at night. He and Karl were the only two who knew about the vomiting for a year and a half, which delayed the eventual diagnosis of achalasia – a condition that restricts the esophagus – and surgery to correct it. Kevin was about 60 pounds lighter than Karl after his surgery, and he never caught up. Karl got a full ride to Iowa and had to prove himself there as a 207-pound freshman defensive end. Kevin got a partial scholarship at Minnesota State University, Mankato, and played linebacker. To this day, Karl gives the family toughness nod to Kevin. Their parents, who grew up on neighboring farms in Caledonia, instilled it. 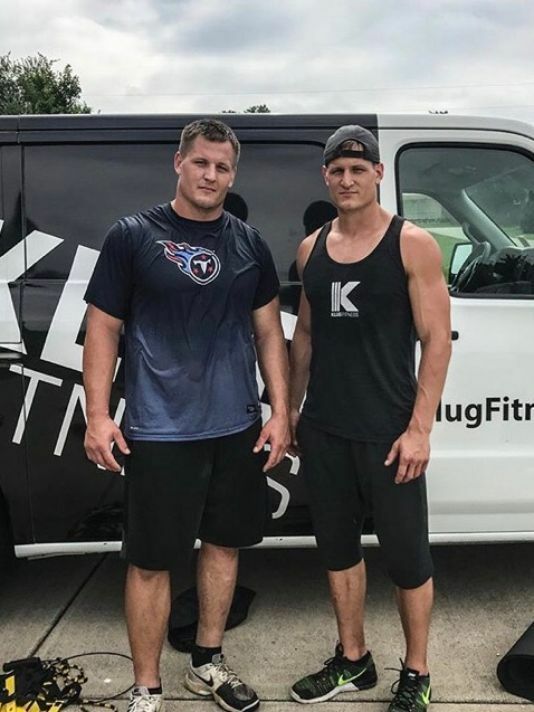 “Grinding is all we knew,” Karl said, and they still work out together with that word as a guide, though in the past several months Karl has had to stick exclusively with the Titans medical staff. That work has further enhanced the Klug name in the Titans locker room, but that wasn’t the point of it. The Titans need Karl and the energy that has created 20 career sacks and so much disruption beyond that number. His comeback is ahead of schedule but it isn’t complete yet.